Super Metal Manufacturing Co. is located in Mumbai City, Maharashtra, India. We are professional mechanical stainless steel supplier from India. 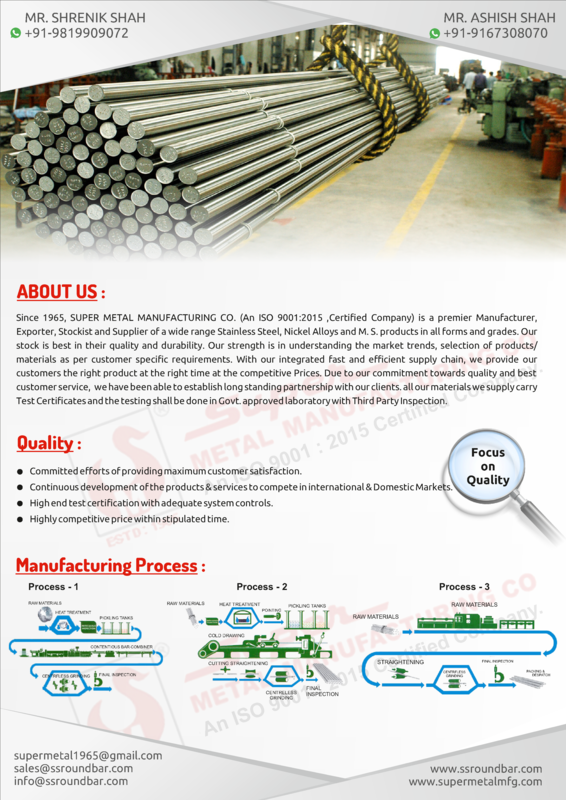 company stands for producing high quality SS Round Bar. Currently, the company owns four modern production lines configured with combined equipment’s from India and abroad, and has the complete set of inspection and testing equipment’s. Now, we have three series of EN/DIN high precision and high brightness Seamless steel round bar, Alloy steel rods and Carbon steel round bar. The products of our company have been extensively used as a substitute of the imported steel rods with the same standard for application in varieties of industries, such as hydraulic system, automobile fabrication, military industry, engineering, locomotive, aircraft, shipbuilding, plastic injection molding, pressure mold, machine tool, diesel, petrochemical industry, power station, boiler, etc. And the good comments have been obtained from the customers.